Final year Dance students said goodbye to university in the best possible way on 21 May, bowing out to rounds of applause after their sell-out final year dance show MDX Dances at Artsdepot in Finchley. The popular venue has become a regular feature on the Middlesex Dance calendar, with 2015 the tenth consecutive year students have performed at the award-winning cultural hub in north London. 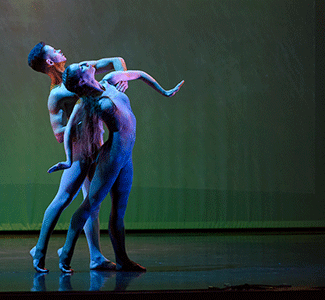 Audiences saw beautiful pieces created by leading choreographers, including renowned New York choreographer Robert Cohan CBE – all performed by students on the BA Dance Performance and BA Dance Studies degrees. Cohan is a Visiting Professor at Middlesex and worked closely with students in the lead up to the performance, providing them with valuable guidance in their preparations for a duet from his 1977 piece 'Forest'. Works by Doris Humphrey, Middlesex Dance Choreography student Bethany Holmes, lecturer Helen Kindred and Artist in Residence Yolande Yorke-Edgell completed the programme. The occasion was particularly momentous for Hendon-based student Jenn Vogtle, who was due to perform in 2014 but was forced to pull out two weeks before the show when she broke a bone in her foot. This year she was able to perform the 'Forest' duet alongside dance partner Joshua Chapman. "After working on it for about a year and a half it was great to finally be able to perform Forest in front of an audience. I'm happy with our performance, but sad that it's all over now," she said "The performance went really well and meant so much to me," added Joshua. "It was surreal having the opportunity to be guided by Robert Cohan himself, having studied his work since my A-Levels. It was an incredible experience and the final performance was the icing on the cake."